This time, it was super-successful! 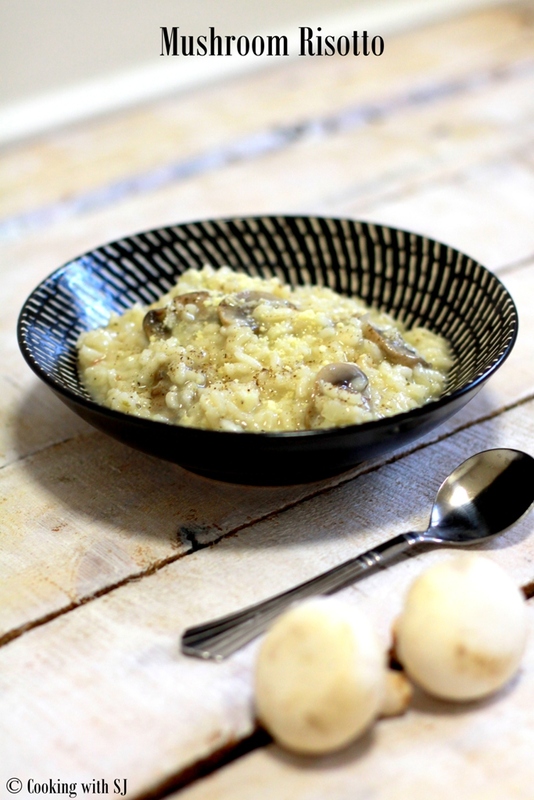 Finally, I know how to make my favorite ‘Mushroom Risotto’ :) Had it several times before, so knowing that it wasn’t the best one, but not bad at all. Will improvise with time, I’m sure :) Here you go with the recipe and hopefully will work great with you too!!! Cut the garlic clove in 2 slices and rub them on non-stick surface of a pan. Heat butter on low flame in a non-stick vessel and add chopped onions. Saute for 4 mins, making sure it doesn’t change color. Turn the heat to medium, add arborio rice and mix well to toast rice nicely with butter. Add white wine in it and keep stirring continuously for 3-4 mins or until all liquid is soaked up. Heat vegetable stock and add one ladleful of stock at a time in it and stir non-stop to get it absorbed completely. Keep following the same trick till the last ladle of stock (approx 25-30 mins). Heat olive oil in a pan and add sliced mushrooms. Cook until they are light brown in color. Add mushrooms in that vessel and mix well. Add last ladle and again stir for a while. Turn off the heat and allow it to rest for 3 mins. Add grated parmesan and a dollop of butter to make it rich and creamy. Add salt and pepper to taste and serve hot!!! You can also add chopped garlic to enrich the flavor. risotto looks super delicious and nice presentation. You have the perfect method to cook with arborio rice! Adding a ladle full of stock at a time ensures not messing up the dish. I learnt it the hard way :) Good recipe Shruti.